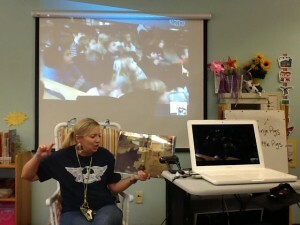 This week at the RBE Library, 2 of our 1st Grade classes got the chance to Skype! On Thursday, Ms. Dolezal’s class Skyped with Ms. Garner’s class in Austin, Texas. Then on Friday Mrs. Conboy’s class got to Skype with Ms. Reames’ class in Yorktown, Virginia. You can see more about the original lesson here. This was an awesome experience for these classes and they really enjoyed getting to meet kids in these other classes and schools across the country. In our Skype on Thursday, our kids and the Austin kids had already read the story and filled out our Venn Diagrams, so we just allowed the kids to come up to the camera and share their comparisons and contrasts with each other. In our Skype on Friday, the other class actually watched and listened to me to read the story. Then, we filled out our Venn Diagrams together. The kids loved coming up to the camera and sharing with the other class!